NASA space shut­tle Colum­bia STS-107 was lost on reen­try in Feb­ru­ary of 2003. Com­pos­er and per­former Anne Cabr­era felt imme­di­ate­ly com­pelled to pay trib­ute to the shuttle’s crew in the most heart­felt way that she knew: through music. 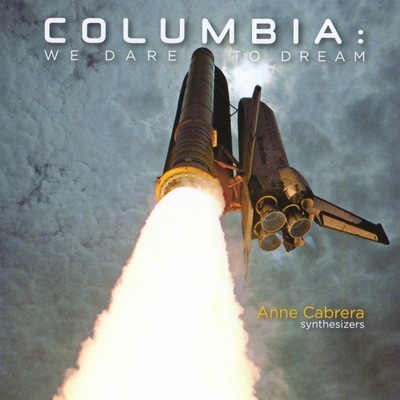 Through this audio CD, Anne both mourns and cel­e­brates those lost astro­nauts. Her cel­e­bra­tion extends to the count­less indi­vid­u­als who spend their days and nights work­ing to turn the dreams of space explo­ration and human­i­tar­i­an sci­ence into real­i­ties. It’s also for those sup­port­ive NASA fam­i­lies who, despite their under­stand­able fears, con­tin­ue to stand behind their astro­nauts. Lis­ten to the whole album right here (or on band­camp), and then down­load the album on band­camp. This album presents more than one hour of music. The includ­ed full-col­or 24-page book­let (in the CD) is filled with Anne’s poet­ry and prose, writ­ten to lend some insight into each of these instru­men­tal pieces. It’s accent­ed with images from NASA’s archives. All tracks were com­posed by Anne, and all parts were per­formed by her on syn­the­siz­er. Some­times she’s emu­lat­ing tra­di­tion­al orches­tral instru­ments, and at oth­er times pro­duc­ing those unusu­al sounds and tex­tures more com­mon­ly asso­ci­at­ed with the syn­the­siz­er. Though the album fol­lows the highs and (sad­ly and unavoid­ably) the lows of the Colum­bia mis­sion, its larg­er aim is to revere the depth of the human spir­it, and the will­ing­ness of some to risk all for the chance to bring ben­e­fit to the rest of us. prefer to own the compact disc?